Marvel has released a new Dr. Strange featurette “Inside the Magic” with insights from Director Kevin Feige, Benedict Cumberbatch, and other cast members. While no official synopsis has been released yet, the previews have peaked our interest. “Your work saved the life of thousands. What if I told you, that reality is one of many?” The Ancient One, Tilda Swinton. “There’s a lot of real world live action in this film. There’s a lot of drama, a lot of comedy, but there’s also the most extraordinary fantastical adventure. I think its going to be a great cinematic ride,” Cumberbatch says. When Kevin Feige says “we’re excited about the villains in this film”, you know moviegoers are in for a wild ride this November. 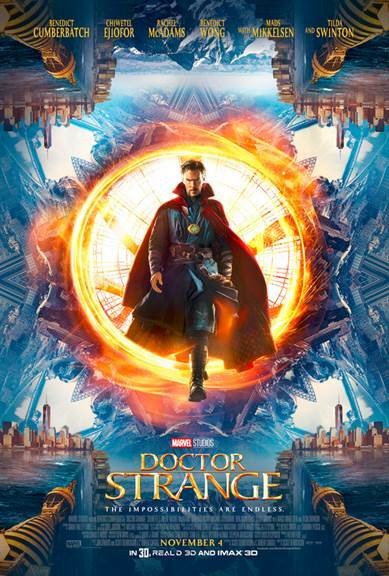 Dr. Stephen Strange, a talented neurosurgeon loses the use of his hands in a car wreck. Strange spends all his money trying to fix the nerve damage in his hands. Running out of options, he travels to Nepal in hopes of finding a cure. Instead, he meets The Ancient One, and she trains him to become a mythical superhero capable of saving the world from inter-dimensional threats. Six weeks until Marvel fans can swarm theaters and explore the new mystical reality from Marvel Studios. Dr. Strange opens in theaters on November 4, 2016. Stay tuned for more updates.